Posted on February 19, 2013 by Elizabeth B. Over at Wyrmflight (see note below! ), blogger debyfredericks took on a challenge that is being passed around WordPress right now: list five fictional characters you’d like to meet. Since she writes about dragons, she chose five dragons, and I’ve decided to pick up the theme and share my own top five. There are many classic dragon books that I haven’t yet read, as well as some well-deserving dragons that I’ve probably forgotten, but these are the ones who came to mind. Toothless, the misnamed dragon. Image borrowed from the How to Train Your Dragon wiki. #5: Toothless—Hiccup’s beloved Night Fury from the movie How to Train Your Dragon is an obvious choice, and I couldn’t leave him off the list. He’s endearing and adorable, and sometimes I wonder what it would have been like to be the one who discovered, saved, and befriended a creature who had a reputation as a fearsome, unknown enemy. Toothless is anything but fearsome to his friends—I think he looks a little bit like a frog, and his behavior reminds me of an oversized cat. 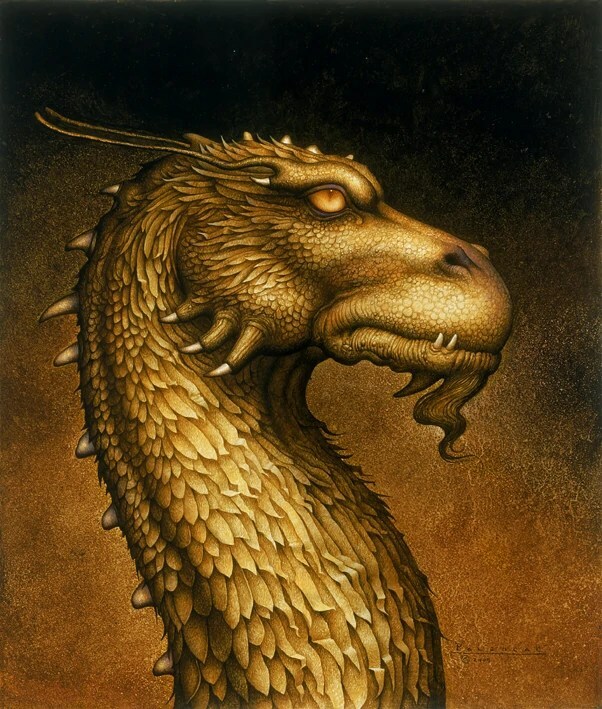 Cover art of Glaedr from the book Brisingr. Image borrowed from the Inheritance Cycle wiki. #4: Glaedr—I have a soft spot for the idea of wise old dragons who act as mentors, which is why Glaedr from Christopher Paolini’s Inheritance Cycle wins a spot on my list. To be honest, I’m not a huge fan of Paolini’s style and never finished the series. Still, from what I saw in Brisingr, Glaedr has the maturity necessary to help shape the young, rash pair of Saphira and Eragon. His experience, wisdom, and advice are all part of the training they need in order to become the heroes they are destined to be. #3: Falkor—It wasn’t that long ago that I wrote about the white luckdragon from The Neverending Story, but that should mean that it is no surprise that he makes my list. As I said then, Falkor is the kind of friend that I think everybody needs. He is wise, kind, and helpful, and even more importantly, full of joy and hope. If I ever needed to go on a difficult, discouraging quest, I would want to bring him with me. Boris is pictured here with Elmer. Image borrowed from Wikipedia. #2:Boris—Ever since My Father’s Dragon was read to me as a childhood bedtime story, I’ve wished that the cute baby dragon that Elmer Elevator befriended could be my friend, too. 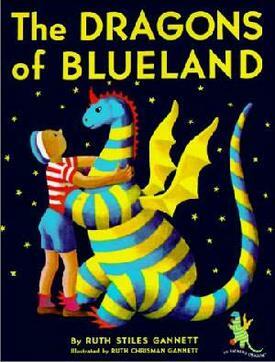 This brave little dragon from Blueland endures captivity, risks a daring escape, willingly helps his friends, and fights to ensure the freedom of his whole family. His family is a bunch I wouldn’t mind meeting, either—they’re all brightly colored and have similarly sweet temperaments. No fire-breathers here! Here’s what happens when a friendly, scaly, red problem gets bigger. Image borrowed from Amazon. #1: Billy’s Dragon—I’m not sure what else to call this one. 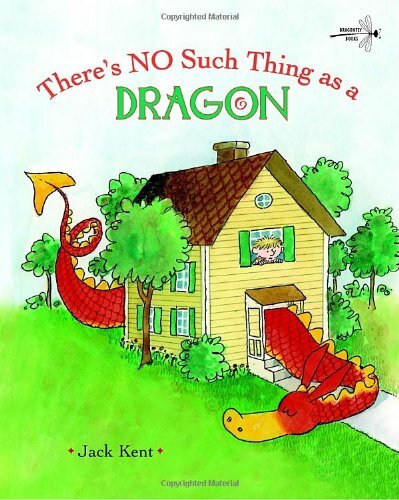 When I was very small, we had a video tape called Merry Mother Goose, with one portion dedicated to a story called “There’s NO Such Thing as a Dragon.” It’s based on a picture book that I haven’t read but really want to find. In the story, little Billy discovers a tiny dragon in his room when he wakes up one morning. He’s not sure where it came from or what to do with it, so he brings it up to his mom. His mother persists in denying the dragon’s existence, insisting that there is NO such thing as a dragon, so the little red animal grows and grows in size until he’s a giant problem that can’t be ignored. The dragon represents what happens when we pretend our problems don’t exist, but he is also an incredibly affectionate creature that, at his smallest size, would make a unique lap pet. I wanted him when I was five, and I still want him now. There’s my list! I would love to hear yours. Let me know if you decide to make a list (dragon or otherwise!) on your own blog. Do you think I left any important dragons out? It’s possible I haven’t read about them yet, in which case I’ll gladly take book and movie recommendations! Come back on Thursday for my list of five dragons that I would not want to meet. Note about Wyrmflight: Wyrmflight, the blog where I picked up this idea, is an excellent blog if you’re interested in reading more on various dragon traditions, whether in history or in fantasy. Written for an audience of both children and adults, it’s all about dragons in a way that is very similar to my vision for Dragon’s Crossing. Go check it out!